Measuring blood pressure in both arms should be routine because the difference between left and right arm could indicate underlying health problems, says a study review. The Lancet research found that a large difference could mean an increased risk of vascular disease and death. 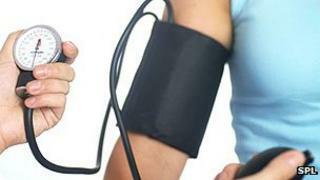 Although existing guidelines state that blood pressure should be measured in both arms, it is not often done. But a heart charity said it was too early to judge the findings. The arm with the higher pressure can vary between individuals, but it is the difference between arms that counts, the study suggests. Dr Christopher Clark and colleagues, from the Peninsula College of Medicine and Dentistry at the University of Exeter, reviewed 28 previous study papers looking at this area. Most people in the study had an elevated blood pressure risk and about one-third had a normal level of risk. The study concluded that a difference in systolic blood pressure of 10 millimetres of mercury (mm Hg) between arms could identify patients at high risk of asymptomatic peripheral vascular disease. It's too early to say whether this idea could become part of standard healthcare practice. A difference of 15 mm Hg would also indicate an increased risk of cerebrovascular disease, a 70% increased risk of cardiovascular mortality and 60% increased risk of death from all causes, the authors said. Peripheral vascular disease (PVD) is the narrowing and hardening of the arteries that supply blood to the legs and feet. There are often no symptoms. The UK vascular check programme for over-40s which includes a test for hypertension, advises that blood pressure measurements be taken in both arms. "But surveys have shown that the average GP doesn't do it," said Dr Clark. Early detection of PVD is important because these patients could then benefit from stopping smoking, lowering their blood pressure or being offered statin therapy. Dr Clark said the findings supported the need for blood pressure checks in both arms to be the norm. Writing in The Lancet, Prof Richard J McManus, department of primary care health sciences at the University of Oxford and Prof Jonathan Mant, from the department of public health and primary care at the University of Cambridge, said the review supports existing guidelines. "Further research is needed to clarify whether substantial differences between arms should prompt aggressive management of cardiovascular risk factors. Natasha Stewart, senior cardiac nurse at the British Heart Foundation, said measuring blood pressure on both arms to assess vascular disease is, theoretically, a quick and simple task. "But it's too early to say whether this idea could become part of standard healthcare practice and so we need more research to confirm the findings." Prof Bryan Williams, from the Blood Pressure Association and the University of Leicester, said the study reinforced the message already in the guidelines from health watchdog NICE.